Several different high-level programming languages are in widespread use today. Some are application-specific scripting languages such as Emacs LISP, MEL (Maya Embedded Language), AutoLISP, MaxScript, and more. There are others more general and suitable for high-level application development such as Java, OCaml, C#, etc. Then we have something known as embedded scripting languages that are specifically designed to integrate easily with larger applications. They bring new functions to applications and link complex applications together. Such scripting languages have well-defined interfaces and they often provide extensive support for utility packages. Python and Lua are two of the most popular scripting languages in widespread use, known for their flexibility for graphical user interfaces. Python is probably one of the most trusted and dedicated scripting languages available today, while Lua is relatively a new scripting language rapidly gaining popularity. Python is a powerful, high-level interpreted programming language used for both scripting applications and as standalone programs. It’s one of the most popular scripting languages available out there and it owes its popularity to its comprehensive feature set, easy syntax, robustness, and an insane number of support libraries. Not only it’s easy to embed Python in an application, it also operates effectively as a standalone application language. In addition, it is open-source and uses a minimalist approach to coding than most languages. The language was devised by a Dutchman named Guido Van Rossum in 1989. Over the years, it has matured to become a full-fledge, interpreted scripting language. Python features dynamic typing but it’s still strongly typed which is not so common to other scripting languages. – Python is a powerful, high-level interpreted programming language used for both scripting applications and as standalone programs and which owes its popularity to its comprehensive feature set, easy syntax, robustness, and a diverse number of support libraries. 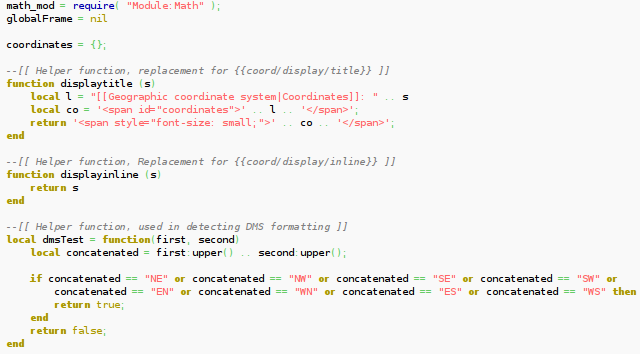 It is open-source and uses a minimalist approach to coding than most languages including Lua. Lua, on the other hand, is a relatively new scripting language known for its diminutive footprint which allows game developers to extend their game engines. However, Lua lacks many of the features such as classes, in heritance, and exception handling. – Lua is a relatively simple programming language that is quite easy to learn and use than many other scripting languages including Python. The language offers a complete set of features and has built-in async features. For someone who knows Python very well, Lua feels quite easy, and they can start building scripts and it’s a matter of hours once you’re familiarized with the basic syntax. Python, on the other hand, is a bit harder to pick up than Lua. While it still is one of the most popular scripting languages out there, the sheer complexity of the Python language can make it somewhat daunting for first time programmers. This is not the case with Lua. – Python has an extensive library support that includes modules for everything. There’s a library for anything you wish to do. Python offers full support for object oriented programming and modules that enforces code reuse and good architecture in a dynamic and high level abstraction environment. It also has mechanisms for exception handling which can be used to develop more robust scripts. Lua, on the other hand, lacks many of the features provides by Python such as classes, inheritance, and exception handling, but it does possess the capability to emulate these properties. – Lua is a fast yet powerful scripting language used as a game engine base language. Lua does not use conditional compilation to adapt its code to different machines; it sticks to the standard ANSI C. With an ANSI C compiler, you just have to compile Lua out of the box. With this approach, it can be viewed as a high-level glue for the game engine process design. Python, on the other hand, is easy to embed in an application, but it also operates effectively as a stand-alone application language. It can be used to develop both desktop and web applications, and video games too. Python and Lua are two of the most popular scripting languages in widespread use, known for their flexibility for graphical user interfaces. Python is probably one of the most powerful and dedicated scripting languages available out there, while Lua is relatively a new scripting language rapidly gaining popularity among the game programmers. Python is known for its comprehensive feature set, easy and clean syntax, extensive library, and more. Lua is known for its diminutive footprint, although it lacks many of the features including classes, inheritance, and exception handling. Sagar Khillar. "Difference Between Python and Lua." DifferenceBetween.net. 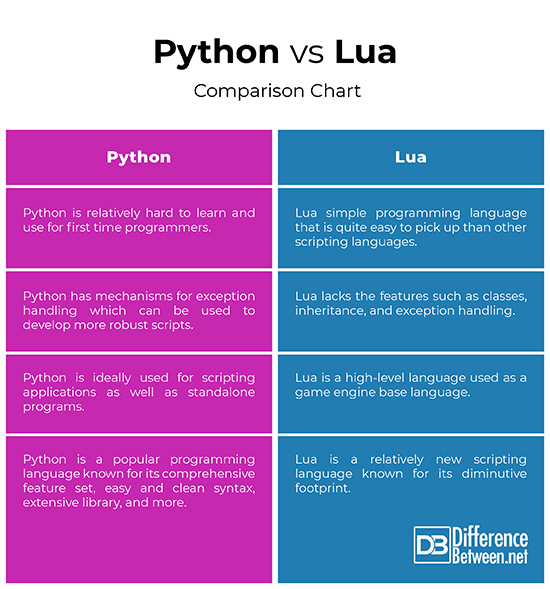 March 5, 2019 < http://www.differencebetween.net/technology/difference-between-python-and-lua/ >.